I can hardly believe it’s been 10 years that I’ve been writing this blog. It was not at all planned that my first post would go live on Halloween, October 31, 2008. It’s an odd anniversary because it’s definitely not my favourite holiday, it just happened. I wrote five posts that first weekend and never looked back. For the first six years I posted four times a week and now I’m down to two posts a week. I decided quality was better than quantity and it works much better for my busy schedule! In 10 years I have written just over 1500 posts, during that time, I stopped saying ‘cute’ too often, my grammar got slightly better (thanks to so many of your comments) and my photography is much improved, haha. Some of my long-time readers will remember my very first header (above). I loved the colourful, whimsical feel of this header and when I switched from this blogspot blog to my own WordPress blog. I considered keeping it, until one of my readers sent an almost identical photo (without the ottoman and fan deck) she snapped on a decorative box at a home decor store in Texas. I didn’t realize that I had not been given original art when I commissioned this header so I let it go. I’m the face and writer, but my long-time partner and now wife Terreeia was the one (almost 20 years ago) who found the first colour workshop for me to attend when I decided I had to be creative or die. She gave me the nudge that made it happen. She’s the one who initially educated me on what a blog was and helped me turn this blog from a hobby to the thriving education business that it is today. She’s also been the constant support I need to keep it going, and I’m so grateful, to her and all of you who stop by to hang out with me here. 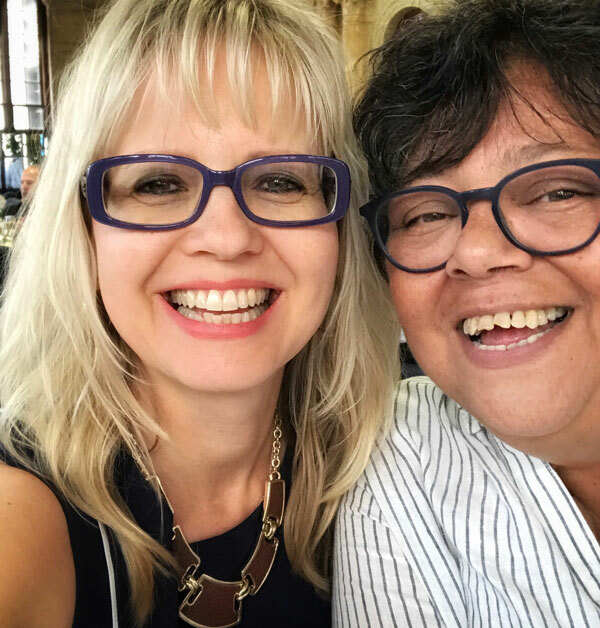 Terreeia was formerly an executive coach and consultant, she officially joined my business 3 years ago when we incorporated and hired a lawyer to get a Visa so I could lead my Specify Colour with Confidence workshops in the US. If you attend one of my workshops, you’ll find her at the back of the room making sure everything runs smoothly. She’s amazing at this, people often comment how organized and well run they are. In her corporate days, she also ran workshops so she has been instrumental in suggesting changes to the course that has turned many students into raving fans! And my course is never the same because colour trends are always changing, and we are constantly improving it. For the first 5 years, she would not let me talk about her at all. She was sure I’d lose most of my readers if I introduced her as my partner. When I finally did here, you were so sweet and supportive. I blogged for almost a year before I figured out how to consult with clients online. I started getting inquiries from readers all around the country asking if I would fly out to help with their new builds, exterior colour, colour consultations and decorating, so I started doing live consults on the phone. However, working one-on-one makes it hard to help many people. I watched other designers create eDesign packages for their clients but they were wrapping up boxes with ribbons and mailing out samples, and since most of my clients are in the US and I’m in Canada, logistically it would have been more difficult to do it that way, so I resisted that model. The eDesign department slowly morphed into the system we use now and it works really well and leaves my clients with a colour plan to either fix their colours, create a decorating plan or create a timeless bathroom, kitchen, new build or exterior! When I originally started writing my blog I had no idea that I had so much to say. I also didn’t realize it at the time that I took a position that was polarizing. I said some very unpopular things such as, skip the trendy accent tile, don’t mix clean and dirty colours, lighting is actually NOT the reason your colour looks wrong, and so on. For my opinions, the critics came out en mass and if we’re honest, they are still around. But I’ve stood firm and true to what I’ve seen in thousands of homes I’ve been in. And in the endless real estate ads and builders’ brochures that are sadly not pretty (you never like the kitchen or bathroom in your next house unless it’s brand new and then it’s still only a maybe). I’ve been a careful observer of design for many years, and it’s what I’ve witnessed that informs what I believe. Seeing so many people make mistakes in their homes that kept them up at night made me sad and I had to say something. So I created a system. Not a theory, but an applied and practical System for Specifying Colour® that would be way more useful than trying to understand colour theory (which, certainly never helped me choose a colour palette). Look, there are many approaches and yes, systems for choosing the right colour, and I believe there is room for everyone inside the tent of style and design. My system is just one way that has proven helpful over the years of writing this blog, so any time a critic comes my way, I just look back at the ten years of your comments, testimonials, encouragement and feel proud that my posts have been of service. If you’ve been around for awhile, you know that I am transparent. I’m open about the mistakes I make in life and in business because I never want someone to meet me in person and declare “She’s NOTHING like her blog” That to me, would be the worst. Because it’s happened to me when I’ve met someone and am disappointed that they are nothing like their online personality. I still cringe when I think about an oversharing (keeping it real) post I wrote about my trip to Italy over 3 years ago that I had NOT read in a long time. However, this summer I linked back to it (WHY?) and one reader promptly emailed me and said “You have issues, I am unsubscribing”. I went back, re-read the post and deleted it immediately, I was so horrified. As hard as I try to be amicable and approachable, I am still unfiltered and sometimes alienate people because I’m open and outspoken. But unfiltered or not, I am committed to personal growth and always willing to share myself and what I’ve learned from giants I admire in this life. I say be true to your true self, because that is all we really have. The created self won’t stand the sniff test so be who you are, warts and all and the world will show up and love you for it. Many of you know how much I love my mama. In the last year, we’ve taken her with us to New York at Christmastime, Palm Springs for the month of January and she joined us halfway on our trip to the Amalfi Coast this summer. I am so grateful to have a young Mom who is such a huge support to me as well as being my best friend. The best thing about doing well financially is being able to share amazing experiences with the ones you love. Almost 1000 fabulous people have attended my Specify Colour with Confidence workshop since we launched it on the blog nine years ago. Since then, the course has changed dramatically, on-line shopping and eDesign have become mainstream and now I spend half a day on that training on the third day. We buy almost everything online these days and almost every purchase involves making a colour decision, so it’s more important than ever to be colour savvy. At every course, we always have two graduate volunteers at the back of the room assisting Terreeia and we always have a long list of True Colour Experts who want to be in the room to listen to the course again. One of the best things I did was to create the private TCE Facebook page so graduates can all share their experiences, expertise and challenges in the world of colour and design. It is an incredibly supportive and caring community with amazing diversity of knowledge and expertise to share with each other. Each course brings new members to the forum with unique gifts to share. I have learned so much from this group and I am grateful to have this wonderful community in my life and business. As I reflect on where I’ve been and how far I’ve come, I’m flooded with gratitude. It’s a marvel of fortune to realize that when I began my career years ago, making a living online via a sort of diary about my passion for colour and design did not even exist as a possibility. But what constantly emerges is intense gratitude for the people in my life who have made living my dream possible. Gratitude for all of you dear readers and friends old and new. You have made this my best 10 years yet. My sincerest thanks to you all. The other milestone I’ve hit this very same week that my blog turned 10 is I reached 10,000 followers on Instagram. The reason why this is a big deal is that I’ll be able to use the ‘swipe up’ feature on my Insta-stories, instead of just referring you to the link in my bio. That is a something worth celebrating too! So to celebrate YOU, I am giving away 10 gifts! To be eligible to win, please post a comment below and let me know what I still need to write and may not have covered in 10 years of blog posts! To be entered a second time, follow me on Instagram too and I will add you in the draw again (or if you already follow me on Instagram make sure you note that in the comments). I will draw the winners on November 22, American Thanksgiving! Thanks so much for everyone who voted for me earlier this week. I’ve been nominated as an influencer with Modenus. I thought I was listed as 53rd and as you all voted, I kept moving up and you let me know “Hey Maria, now you’re at 18, now you’re at 12” I didn’t realize I moved up as the votes came in, haha. Please vote for me (again)! You can vote every day until November 2 here! I really love my readers, thank you so much for supporting me, posting comments, because of you, my world is so much more enriched! Keep blogging, Maria! Congratulations on your 10 years! Congratulations! I wish I’d found your blog earlier so I could have followed along as you grew into yourself, because I always enjoy your posts. If there’s something you haven’t covered in this blog, I’m not sure I would think of it; you’ve already covered so many things I hadn’t thought about until I read your post about it. I live in an apartment where I cannot change the wall color, flooring, kitchen, bath, built-in light fixtures…but I can still use your information in choosing accessories, furniture, and soft goods. And in arranging vignettes around the rooms to balance the colors I’m stuck with and the colors I love. Maybe that would be a good post, about how useful your info is even when you have little ability to change things? And now I’m off to follow you on Instagram and…there, that’s done! Are primary colors a trend? Maria, I’ve been reading your blog for a few years now, and it has been such a blessing in my life. I have redone two kitchens in the last three years and your wonderful advice kept me from making a huge mess of them. Some of the advice you have given that made all the difference for me was: timeless means keep it simple (especially with your kitchen backsplash! ), white paint won’t do what you think it’s going to do in a dark room, it’s okay to have a white kitchen, ugly costs the same as pretty (sometimes more!) so do it right the first time around, redoing things in small increments is allowed because you are moving forward. Such good, sound advice for so many of us who don’t know what questions to ask, don’t have an artistic background, and just generally don’t know what we are doing. You gave me the confidence to pick out paint colours (I have your White is Complicated book), paint over old cabinets that still have life in them, and stain my wood flooring a timeless colour. We recently bought a foreclosure home that had seen some hard days. Everything had to be fixed, ripped out, replaced, sterilized and/or dunked in paint. We are about halfway done and are on track to be finished by the end of this coming summer. When my husband says, Are you sure about this paint colour, floor colour, light fixture, cabinet style, countertop quartz instead of granite? etc., I have the confidence to say, Yes. When my neighbor walks by as we are getting ready to paint the pink-beige brick Benjamin Moore dove white, and says, Do you know what you are doing?, I have the confidence to say, Yes! So Maria, thank you so much for helping me create my forever home. It makes me happy every time I drive up to it, every time I walk into it, and all day long while I am in it! I know you will be blessed for so willingly sharing your talents with all of us. Someday we will add a dining room onto our kitchen and will make some major changes. I love black and white kitchens and am thinking of going that direction. Are black and white kitchens trendy or timeless? Or both? I know, from reading your blog, that I am definitely influenced by the trends. The first house we built, over 20 years ago, had maple cabinets, lots of carpet, and brass fixtures. And this was in the days before computers and internet! And we lived in the country. And I was still unknowingly influenced by the trends! So I would love it if you did a post on black and white kitchens. Love your commitment Maria. What to cover? Would love to see your inspiring ideas on decorating a travel trailer. The small space limits our sight lines and all accessories must withstand the bumping that comes when we drive. I know that you work on actual houses but my family spends part of the year in the trailer it would be fun to jazz it up. I spent the last two summers in the trailer and got tired of the brown interior. Congratulations on this exciting milestone! I love learning from you! Whatever new topic you cover, I want to “get it” and be able to bring that knowledge to my clients (I’m a stager) and thus truly help them pick colors that will work and help their homes sell faster! I’m a sponge – have bought all your ebooks and online courses. My dream would be to attend your Specify With Confidence Workshop! AND I FOLLOW YOU ON INSTAGRAM!! OK, I actually have 2 blogpost ideas. First, I am understanding the neutrals, but when EVERYTHING is already neutral (say in a kitchen – and not a beautiful white, but boring beige), isn’t it a good idea to paint the walls a color? My question is how do you know what color to choose? In your blogpost “Best Backsplash Color for Stained Wood Cabinets,” you said that since the countertops were pinky/taupe that blue would be a good choice for wall color. How did you know that? Is there a blogpost where you help us to know what COLOR goes well with different neutrals? Second question – Hardwood floors. I know you love them (I do too) . . . BUT have you ever written a blogpost where you address some of the drawbacks of hardwood floors (and maybe solutions)? When you pick up a rug and see that the wood outside the rug has changed color . . . when dishwasher overflows and the entire wood floor has to be replaced . . . when you want to change the color of an engineered hardwood floor, but can’t because the “wood” part is too thin . . . when you have dimples where someone wore high heels. Would love to hear your thoughts. Congratulations on your wonderful success. Your posts are informative and encouraging. Your love of your family is reflected in the beautiful homes you inspire and create. I appreciate you being authentic as you share your journey with us. We all have issues…lol! I have learned innumerable lessons from you and want to say Thank you!!! Have you done any posts on wood trims, that are not painted, in creating a light and bright room that has contrast to the trim. Struggling with Natural Alder wood trim. One other blog post idea – Have you ever written a post about LRV and is it important in terms of picking paint colors? Forgot to mention that I follow you on Instagram too. Congratulations!! How about writing about trends in paint again, going forward into 2019 an beyond? I am widowed and just got a house. Tired of light grey walls and white trim…..
Want to do something earthy. I enjoyed you sharing something so personal about yourself in this post. I applaud your bravery and your being true to yourself in spike of what people may or may not think, there is just no other way to be. I’m in my fifties, and I’m so glad to see that people in general have been opening their minds as well as their hearts when it comes to alternative lifestyles. I’ve been reading your blog for close to a year now, and I really look forward to your posts. Thank you so much for all your hard work and keep blogging!! !